Though it's largely flying under the radar, Congress, government oversight offices, and the Pentagon are throwing their weight around in a numerical sumo wrestling match over the F-22A Raptor. While the battle is over dollar estimates of the cost of multiyear procurements (MYP) of the Raptor, the larger war is over what constitutes "substantial savings" in defense procurement programs and the integrity of the Pentagon's analysis and management. Congress' investigative arm, the Government Accountability Office (GAO), believes that MYP will cost $1 billion more--thereby eliminating its rationale--and has even called for the Pentagon to be "sanctioned for poor analysis and weak program management," according to Dow Jones Newswire (article not available online). Senator Saxby Chambliss (R-GA) and over a dozen senators who are co-sponsors to his amendment, SA 4261 (pdf), to the FY 2007 Defense authorization bill assert that MYP will lead to savings. Originally, the Air Force estimated savings of 5-7%, approximately $400-500 million, projected using historical data. 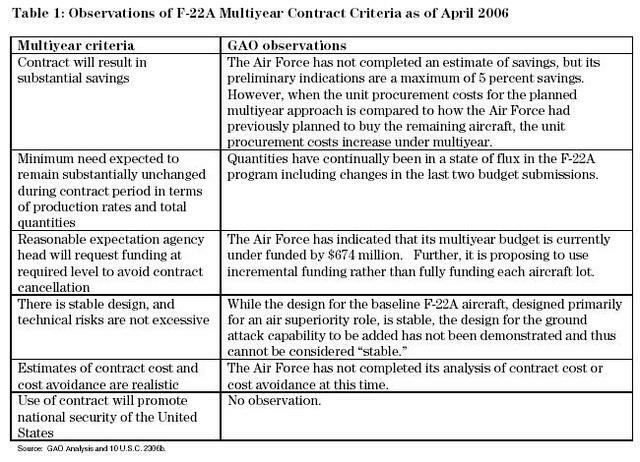 Yet the Institute for Defense Analyses (IDA) May 2006 “F-22A Multiyear Business Case Analysis” pegs the savings in the range of 1.8-2.2%, with a minimum of $225 million saved--substantially less than the original estimate. Fourth, projections of MYP savings are not always fully realized. The 2007 future year's defense plan added $1.05 billion for a 60 aircraft multiyear procurement contract and subsequently the Air Force identified an additional $674 million needed to fully fund this plan. Therefore, the total additional multiyear procurement cost is $1.724 billion. Furthermore, it will add two years to the F-22A procurement program. The GAO finds that the per unit cost of F-22As will shoot up 10% from $166 million per plane to $183 million if the proposed MYP plan is used. Despite all the bad news swirling, Lockheed is trying to take advantage of the muddy water. Last week, we alerted the media to an email we obtained, wherein Lockheed Martin Vice President AKA lobbyist, and former Air Force "chief of weapons systems", Jack Overstreet asked senior Senate staffers to vote "yes" on Chambliss' amendment. Overstreet cited the IDA analysis to support his contention that the MYP was consistent with the law and yielded "substantial savings." Even if one chooses to ignore the GAO's findings that MYP will lead to cost increases or whether 5% savings are even "substantial," GAO points out that the other criteria necessary for multiyear procurements under 10 USC 2306b are not currently being met. See the table below.